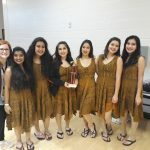 Catamounts News · Mar 26 DHS Color Guard places 1st at Mill Creek! DHS Color Guard placed 1st this weekend at Mill Creek High School. Mrs. Amber Dean leads out group! Congratulations to our Color Guard and Coach Dean!! !